RULE 41: Essential information is required to be provided in all advertising materials directed wholly or mainly at persons qualified to prescribe or supply except for those materials that are specifically exempt from this requirement. There are two forms of essential information that can be used in different circumstances: long form and short form. NB. 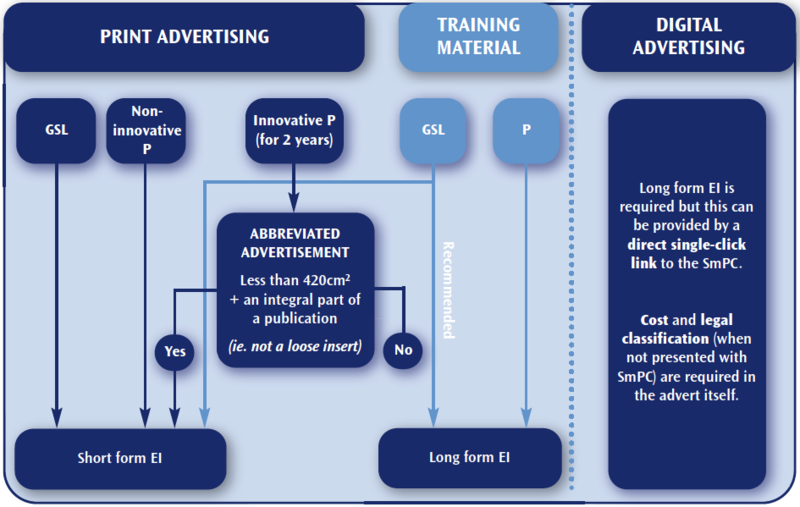 For advertisements for innovative pharmacy only medicines that are less than 420cm2 that are an integral part of a larger publication (not issued in the form of a loose insert), the short form essential information is acceptable. date: the date when the essential information was drawn up or revised should be included if the advertisement is not bound into a dated publication. *There is an exception for audio-visual advertisements and advertisements in a journal printed in the UK but with a circulation outside the UK of more than 15% of its total circulation. For advertisements on digital platforms the long form essential information should be included however, these requirements can be met by the inclusion of a direct single-click link to the information listed above. Cost and legal classification are not included in the SmPC but must still be included in the advertisement or linked information. For Traditional Herbal Medicines (THMs), the statement ‘Traditional herbal medicinal product for use in [specify one or more of the indications for the product consistent with the terms of the registration] exclusively based on long-standing use as a traditional remedy.’ This statement must be sufficiently prominent to ensure that recipients of the advertisment understand that the product is a THM. Whilst there is no requirement to include information on adverse event reporting within advertising materials, it may be helpful to do so. Advertisers who choose to include this information may wish to use wording similar to: ‘Adverse events should be reported. Reporting forms and information can be found at yellowcard.mhra.gov.uk. Adverse events should also be reported to [relevant pharmaceutical company]’. Note: When promoting medicines for use during pregnancy, member companies should refer to rule 18 and to the MHRA’s guideline ‘Medicines which are promoted for use during pregnancy’. in factual and informative announcements that include medicinal claims1. This does not include those that can be seen on a true representation of a pack, or as a straightforward representation of the indications (please refer to section 1.3.4). Factual and informative announcements include documents such as trade catalogues, price lists and planned-list order forms (PLOFs). 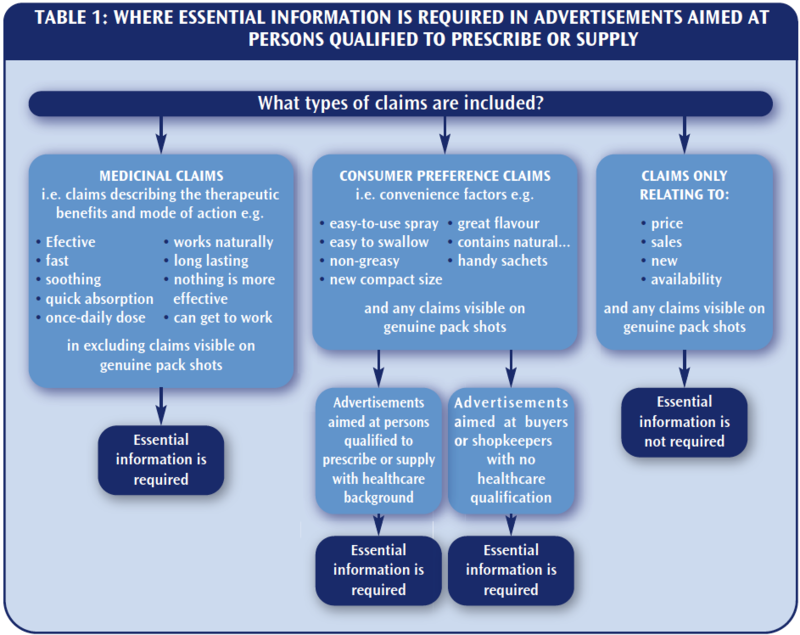 Whether the essential information is needed on a PLOF will depend on who the target audience is (persons with or without a healthcare qualification) and on what claims are included. Table 2 can be used as a guide to whether essential information should be included. 1 Please refer to section 5.1, for a definition of ‘product claims’. RULE 42: The essential information required in professional advertising must be prominent and clearly legible. Advertisers are responsible for ensuring that the essential information is clearly legible. The information below describes the minimum requirements in terms of font size. However, there are several additional factors that affect legibility; attention should also be paid to issues such as number of characters in a line, line spacing, type style, print quality, contrast between text and background and identification of headings. Part 14 of the Human Medicines Regulations 2012 requires that the active ingredients are listed immediately next to the most prominent display of the product name. The most prominent display of the product name is subjective. However, where a pack shot is featured, this is generally considered to be the most prominent display and a list of all actives should be placed adjacent to this. No set font size is required for essential information on items, such as posters, that will be read at a distance. It is the advertiser’s responsibility to ensure that all of the essential information is clearly legible. Careful consideration must be given to the distance from which the advertisement will be viewed. The essential information must be horizontal. It is not acceptable to have the information upside down in relation to the advertisement, printed in a spiral fashion, around the outside of the advertisement or in any manner that makes reading the information difficult. Essential information should be contained within the advertisement or, in the case of a full A4 advertisement or similar, on a facing page, provided there is no intervening editorial or pictorial, etc. With regard to website banner advertising, the essential information may be provided by adding a direct and prominent link to the necessary information. In the case of multiple-page advertisements, information is not required on each page provided there is a clear reference on the front page referring the reader to where the information can be found. This is only applicable where the advertisement is on consecutive pages with no intervening editorial. The reference must measure at least 1mm in height. For the majority of fonts, this equates to font size 8. Essential information needs to appear only once. For example, if a pack shot includes the name and indications in a legible manner there is no requirement to repeat the name and indications elsewhere. RULE 43: In the case of audio-visual material, such as films, video recordings,etc., and interactive data systems, the essential information must be provided in written form. This may be provided either by way of a document that is made available to all persons to whom the material is shown or sent, or by inclusion in the audio-visual recording or the interactive data system. Audio-visual advertisements and advertisements on interactive systems require the full essential information to be included and are not eligible for the inclusion of abbreviated essential information. It is acceptable to provide the essential information audibly as an addition to the written form, but not instead of the written form. RULE 44: In the case of audio material consisting of sound only, the essential information must be provided by way of a document that is made available to all persons to whom the material is played or sent. Audio advertisements require the full essential information to be included. They are not eligible for exemption from the requirement to include full essential information. It is acceptable to provide the essential information audibly as an addition to the written form, but not instead of the written form. RULE 45: Promotional aids are not required to comply with the requirements to include essential information, provided they feature no more than the product name or reasonable abbreviation thereof and the trade mark protection. Promotional aids are items that have a purpose other than to promote a medicine but which display a product name as a reminder. Examples include pens, mugs, coasters, note pads and mouse mats. Promotional aids are exempt from the requirement to include essential information, as set out in rule 41, if they bear no more than a product name, a reasonable abbreviation thereof or an umbrella brand name and a trade mark protection. However, if any additional information is included, such as a strap line or a visual representation of a claim, the item will need to carry essential information. The list of acceptable gifts in rule 33 may also be used as guidance on the provision of promotional aids. However, items not considered to be relevant to the practice of medicine or pharmacy are not excluded. For example, depending upon the circumstances balloons may be used as promotional aids. Promotional aids intended for persons qualified to prescribe or supply should cost no more than £6 excluding VAT. Advertisers should also take into account the perceived value, which is the price at which recipients could purchase the item themselves.